Whatever kind of content you create – feature film, short, webisodes, transmedia, YouTube – this book is for you. 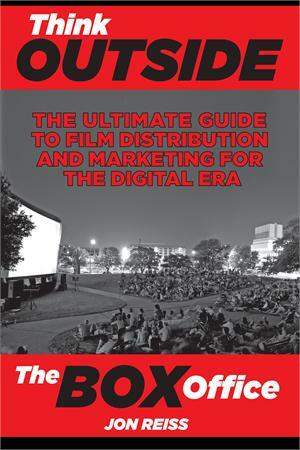 Think Outside the Box Office by Jon Reiss is the first nuts-and-bolts guide for filmmakers who want to take control of their own distribution and marketing destiny. Each chapter addresses an essential aspect of a film's release and gives specific techniques to filmmakers to create success with their films in today's marketplace. Covering everything from theatrical, grassroots/community, publicity, sponsorships, live events to DVD sales, affiliates, to social networking/web marketing to monetizing digital rights including YouTube, iTunes, Amazon, to crowd-funding, and audience identification its all here and more. Jon Reiss is a critically acclaimed, award winning filmmaker whose experience releasing his documentary feature, Bomb It with a hybrid strategy was the inspiration for writing Think Outside the Box Office. He consults and speaks about distribution and marketing for film at festivals and forums throughout the world, and also teaches at the Film Directing Program at the California Institute for the Arts where he created the class "Reel World Survival Skills: Everything I Wish I Had Been Taught in Film School." This course covers the practical aspects of surviving as an independent writer/producer/director in today's economy from finding a job, pitching and script development, to financing and new models of distribution.